Weather officials dropped all warnings Saturday after tropical storm Lane weakened and turned away from Hawaii. The storm began moving to the west, breaking its northward march toward Honolulu after drenching the Big Island and Maui over the past two days. The slow-moving storm, moving less than 5 mph, dumped nearly four feet of rain on the Big Island and about a foot on Maui before it was downgraded Friday to a tropical storm from a hurricane. The storm was about 110 miles south of Honolulu, but the state’s most populous city was largely spared from any impacts. The National Weather Service recorded about 2.3 inches of rain on Oahu in a 24-hour period ending early Saturday. Shops along the famed Waikiki beach in Honolulu were reopening for the tourists. Forecasters had said as much as 10 more inches of rain could fall on parts of Oahu and Maui. “Don’t let your guard down,” Brock Long, administrator of the Federal Emergency Management Agency, said during a telephone briefing early Saturday in Washington. Rain began falling several days ago on the Big Island, which has received nearly 4 feet in some areas. 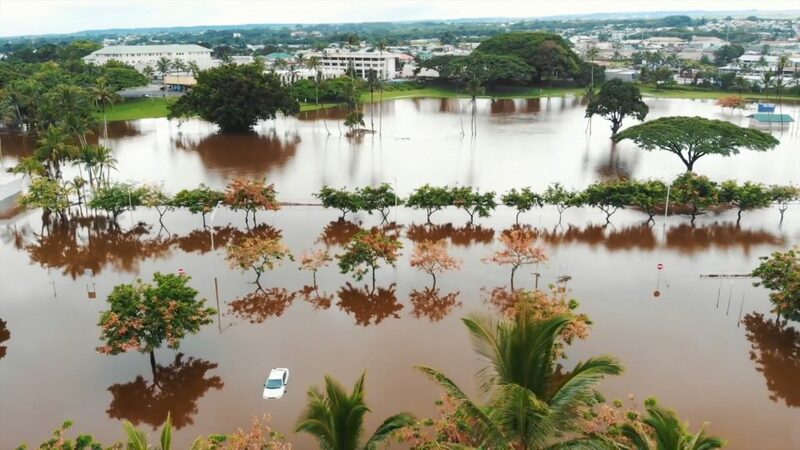 Authorities rescued people from more than 20 homes overnight, Hawaii County Managing Director Wil Okabe said, and landslides and pooling water forced the temporary closure of several highways. The rainfall eased early Saturday.